You will always know what happened in your absence. Everyone hopes that personally his apartment, garage or cottage will not fall into the view of intruders. And even if someone tries to climb inside, they will save strong doors and constipation. However, just in case there is a lock, as a rule, a clever master key. Therefore, we want to introduce you to the useful gadgets from the ecosystem of the smart home Sonoff, which will help protect the integrity of your property. Next, install the eWeLink application on your smartphone. It allows you to control not only this alarm, but also any other elements of the smart home , which are produced by Itead . With eWeLink, you can customize the schedule of components and the interaction between them. In the eWeLink application, click on the plus sign at the bottom of the main window. After a brief scan, the system will provide the ability to specify the data to connect to your Wi-Fi network. As a result of the steps taken, the application displays the RF Bridge device. Mount the CD100S to a door or window using the supplied adhesive strips. Now, each time you try to open it, it will work, a notification will appear on your smartphone, and the corresponding entry in the eWeLink application log. 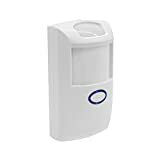 The motion detection sensor Sonoff PIR2 boasts the presence of an additional sensor that overlaps the blind zone from below. In addition, he knows how to screen out false positives, which makes it possible to use it even in rooms where there are pets . To install the sensor on the ceiling or wall in the kit has a special hinge mount. Security is one of the few things in life that really matters. You can never neglect elementary measures and postpone them for later. Especially when the safety of your apartment , cottage or car is at stake . It is better to spend now a little money and time to set up an alarm than to later regret the loss.